What is an agent-based virtual laboratory? I have recently had several conversations with colleagues and exchanges with reviewers about the exact meaning of the term ‘agent-based virtual laboratory.’ So, it seems like the perfect time to devote a single post entirely to unpacking this idea. First, I should acknowledge that many researchers have used agent-based models (ABMs) of differing levels of detail or abstraction to explore the influence of particular processes or parameters on model outcomes. This is certainly a valuable exercise, and in this sense, the virtual laboratory approach is not new. However, these virtual lab efforts have been undertaken with site-specific, case-study ABMs – and this is where the distinction lies. That is a favorite phrase I have used in multiple presentations on this topic. It is meant to make a clear distinction between ABMs as tools, and virtual labs as an approach. The type of virtual labs I use in my research and write about here are designed from the outset to be generalized modeling environments that can be applied across many different settings and locations. The advantage of this is that one can conduct comparative research – forming hypotheses of how and under what conditions certain processes or factors will be important or not. These hypotheses can be generated systematically across sites and then tested against empirical data. More conventional virtual lab efforts use case-specific ABMs and thus cannot be easily applied to different sites. Take, for example, the figure to the right, which shows agricultural intensification patterns generated by agents with generalized decision models in response to alternative environmental conditions. 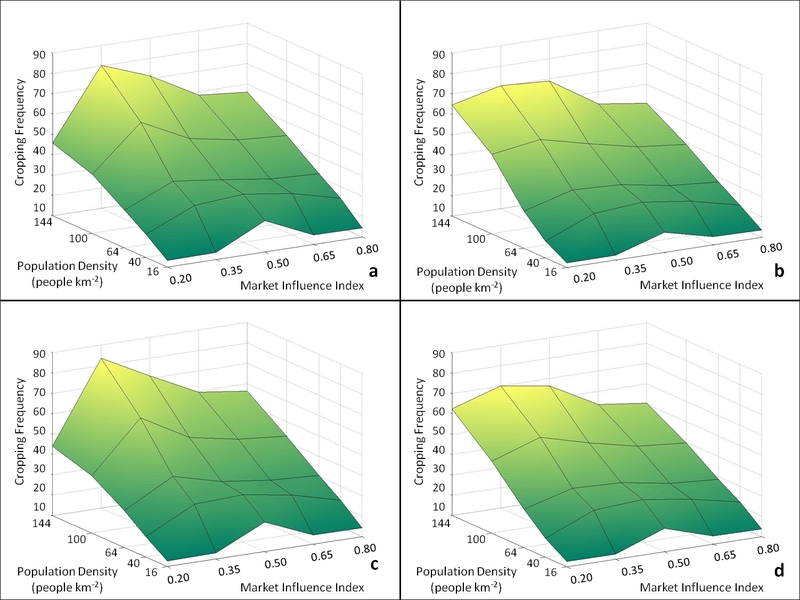 With this framework, the influence of environmental suitability on land-use intensity – and its interactions with other processes, such as increased market influence and population pressure – can be experimentally explored across different sites. With that said, if one desires to understand a particular context and/or predict possible future scenarios, the case-specific ABM approach is the way to go. There will always be a place for such models. But those models are not the best option for generating generalized knowledge and building theory. For that, a more generalized and transparent modeling framework is needed. This approach is similar to that of “artificial systems research” that my friend and colleague Len Troncale describes. Quoting from one of his blog entries, a virtual lab approach “enable[s] adding or subtracting different sets of systems processes to see how these alterations effect sustainability of the resulting systems.” Thus, the goal of agent-based virtual laboratories is to explore and form testable hypotheses of how certain factors interact with agents’ decision-making processes to produce emergent system outcomes, and to do so across different land systems to build towards general land system theory. This entry was posted in Agent-Based Modeling and tagged agricultural intensification, decision models, environmental suitability, favorite phrase, model outcomes, virtual laboratories. Bookmark the permalink.